About a month ago I joined a running group called Black Girls RUN! Atlanta. 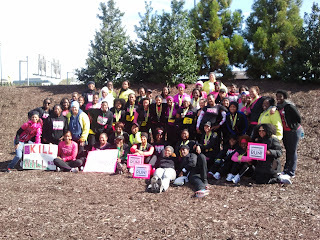 BGR-A, is a chapter of the national fitness organization, Black Girls RUN! The Atlanta chapter, however, has over 3,500 members- making it the largest running group in the STATE! As such, you can imagine how scared I was to join. I thought I would be the slowest, fattest, most out of shape-st in the group. Buuuut, my desire to be in the best shape of my life by 30 is greater than my fear of being embarrassed. So I did it anyway, and of course I wasn't any of those negative adjectives listed above. The person who posted the aforementioned quote recently finished a half marathon and was the first of all our relay teams to finish the relay. Yesterday, she a said that she completed her last mile in 7 minutes and 20 seconds! Can you imagine the amount of training, discipline, and heart it takes to do that? I am sure she was excited to see us cheering for her at the end, but we were not on the course the entire time. She had to motivate herself. No one would have known if she walked or stopped or any of that. Even now, I can't say for sure that she didn't...(although I doubt it since her team was 8th out of the 100 teams that competed). My point is, she did what she had to do regardless...because she had a personal goal...a promise to keep to herself. About two weeks ago, I started doing a little exercise called the #30daythankyou. I started on the anniversary of my mother's death. My mom passed when she was only 42 years old and as I approach 30, I am more and more aware of how important it is to give people their flowers while they are still alive to smell them. Beyond that, I love the way it makes me feel tell someone thank you. I have found that it feels good to the giver and to the receiver. I was so excited about my little activity and really expected that everybody in the world would get on board. However, quite the opposite happened. Of the ten people that I would say are my closest friends only one of them has done it more than once....even after I asked. Part of me wants to be hurt about that...I guess part of me is...but in those moments when I feel like I am out here on my own...I remember 2 things. 1. GOD IS ALL THERE IS and 2. So what? So what, if the people who I thought would support me don't. There is so many more people doing it that I never even considered would. So what if this road feels lonely and hard sometimes. The true measure of my person is not how many fans or fireworks I have . It's in the work that I do...when there are no fireworks...when there is no cheering section....when there is no one but me and GOD. It's a tough space to come to, but it's necessary. There is a lot of shame associated with the quarter-life crisis. People don't want to talk about the uncomfortable feelings that come with being confused, unemployed, single, broke and so on. Some people won't even publicly join the community because they don't want to be known as someone who can identify with these feelings. Some people may even be too busy, or selfish, or absent-minded to even find value in an exercise like this. I can understand that. Believe me, I get it...all of it. But, what I also get is, at the end of the day the only person I have to be accountable to is me and GOD. And since GOD, is just a manifestation of my higher self...it goes back to me again. There will always be people to clap for me at the end. People to wear t-shirts and take pictures and to say they, "knew me when." I am grateful to them for lending me their cheers....later on. But I can't afford to wait for those cheers to start (or to keep) running. I started studying metaphysics because I was a depressed, overweight, unemployed, single....addict. I didn't think there would be a blog or a book or any of this. I just didn't want to feel that way anymore. Period. Now over 5 years later, I am clean...in love and officially not overweight. In truth, there was no one there when I cried and threw up for hours as I withdrew from huffing, or when I lit candles on my alter for a year praying my soulmate would find me. Or even when I stopped eating solid food for two weeks to jump start my sobriety and my weight loss. I did it...it was hard as ****. But I did it..because I had to. I don't know why I thought this would be any different? I know that I am part of a whole...but I also know that I must do my best to keep MY part WHOLE. I now know that this life is my marathon and I am going to keep running...even when I am alone. Even when I am tired...long after everyone has gone home and all I can hear are my feet hitting the pavement and my heart beating in chest. I don't need a fan club to be a star or a cheering section to be a WINNER. (and neither do you).
" I know that I am part of a whole...but I also know that I must do my best to keep MY part WHOLE. " I love this! You are aware of the "what", you are living it. The how will continue to reveal itself as you allow life to gently unfold. Whew! that was a lot. Thank you. I loved it. @Jessica...thanks girl..it get crazy emotionally but I am just trying to have faith and keep moving. @frizzy...be quiet lol. I don't write that much lol. How can I follow your blog...didnt see an option on the site. Thanks for reading ya'll.